Hi, so I came across this site when my dad forwarded it to me. I've been feeling really down lately and when I read that talking about what has happened might make me feel better, I decided to give it a shot. This might not be totally comprehensive, so bare with me. was that it had minimal swelling, I was able to walk right after, even jog a little (with that weird feeling that I now know was the feeling of my being unstable). Throughout the whole thing, I was simply devastated and depressed. Soccer had been and IS my life. I had been playing for around 11 years and had become captain junior year and wanted more than anything to at least play collegiate soccer at the D1 level. And for anyone who knows, D1's recruit early junior year and even late sophomore year. Honestly, I thought my life was over. But then I rehabbed hard, spent most of my time in the gym and I came back. I started practicing full time 6 months out and played my first game at around 9.5 months. I felt that I had started slow and didn't even think that I could tear it again. I didn't wear a brace or a sleeve. I was just getting back into my groove when during my 4th game after surgery, I was sprinting and my right leg didn't stabilize and I went down. The trainer said that I had torn my MCL, but at that time, I didn't trust any trainers or doctors except my personal orthopedic surgeon who had done my surgery. We went to him immediately 3 days later and he said that there wasn't a doubt that I had torn my right ACL, had a grade 2 strained MCL, and a grade 1 strained LCL. So that's basically where I am now. I just feel like everything in my life is going down hill. The one thing that I truly loved and was passionate about has basically gone out the window. I failed just when I started getting looks from D3 colleges and started feeling happy again. My surgery is scheduled for the 21st of January and I plan on having an allograft done. 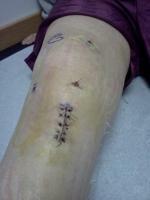 I had an autograft patellar tendon last time to minimize rehabilitation time. However, I want to take things slow this time and make sure that nothing goes wrong. But it's really hard to keep my head up at this time when I feel that everything I learned from my last surgery and injury just went out the door. Why did this have to happen to me? Maybe God's punishing me? I don't really know.